Starting in October and throughout the winter some of my favorite comfort foods are of German descent. I suppose that is mostly because I too am of German descent, and to me they mean a return to the tastes and smells that I’m somewhat familiar with from when I was a little girl. Oddly enough, our very best friends are also of German descent and J had even lived there as a young boy. P & J have visited German many times over the years, and I’ve always listened wistfully as they told their stories of the German pubs, the forests, the folk, the countryside, the foods and pastries they’ve experienced while there. Germany is on the top of my bucket list of places I want to travel to. However, until the time that we are physically able to do that, we can at least take the trip in our mind and on our taste buds by recreating this old German Breaded Pork Schnitzel! I made this Pork Schnitzel to celebrate our dear friend P’s birthday. I was completely thrilled to hear them both say that it was some of the best schnitzel they’d ever had. With P & J being the authority of authentic German schnitzel, I took that as quite a compliment!! Glad you enjoyed it, P! Happy Birthday to YOU!!! 1 2-3 pound pork tenderloin, trimmed of silver skin and cut into 2″ rounds. -Using a rolling pin or meat mallet, flatten each cut portion of pork into 1/8″ thickness being careful not to tear it. Season each cutlet with salt and pepper. -In three shallow dishes, place the seasoned flour in one, the egg in another and the panko breadcrumbs in the third. -Using tongs, dip each piece of flattened pork first into the flour mixture (coating on both sides), then into the eggs (coating on both sides) and then into the panko (making sure to press the crumbs into the pork, and coating on both sides). Place the prepared cutlets onto a platter and chill for at least 1 hour. -20 minutes before you’re ready to fry, remove the schnitzel from the fridge and allow to come to room temperature. 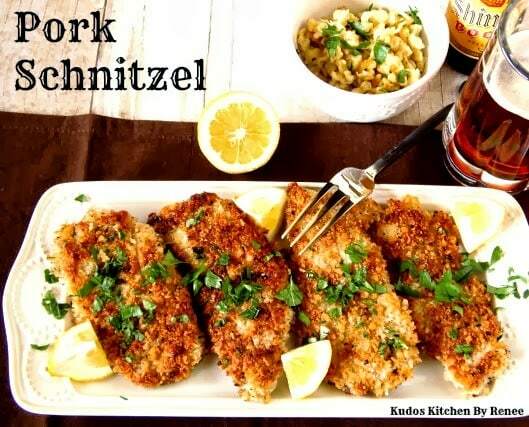 -In a large skillet on medium/high heat, add about 1 1/2 tablespoons of canola oil and fry about 3-4 of the schnitzel at a time until they’re golden brown and crispy. Note – The cook time on the schnitzel is only about 1-2 minutes each side because they’re so thin so they’ll need your undivided attention. -Continue working in batches to pan fry the schnitzel adding additional oil as you go. 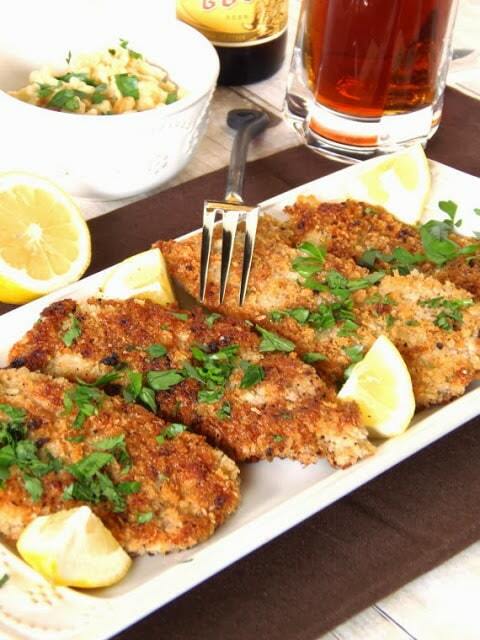 -Arrange the schnitzel on a serving platter and garnish with parsley and lemon wedges. -Enjoy and savor every bite!!! 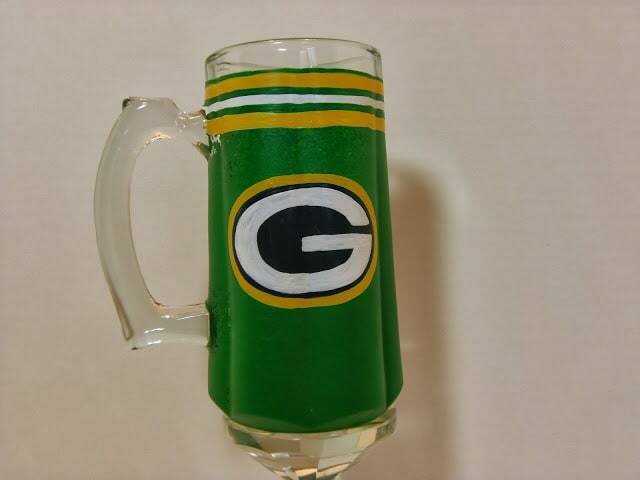 Along with my cooking and baking, I specialize in creating hand painted glassware and tile items. I can work from any photo or description you send my way. Please contact me if I can paint something for you! Kudos Kitchen By Renee ~ Where food and art collide on a regular basis!!! Handyman, Crafty Woman – Wicked Awesome Wed. THANK YOU FOR HOSTING THE PARTIES LADIES! HOPE YOU HAVE A LOVELY DAY!! I've always wanted to make schitzel. Looks delicious. I've had chicken schnitzel but never pork schnitzel. When I saw that you made yours with pork tenderloin I was delighted as we have some tenderloin in the freezer. I'll be using your recipe when I make this for Ron. No better recommendation than one from German friends who know from whence they speak! Looks wonderful Renee. I love schnitzel – reminds me of my dad. When I made it I whisk my eggs with a little bit of milk instead of water, and add some of the powdered parmesan cheese and salt and pepper to my bread crumb mixture! 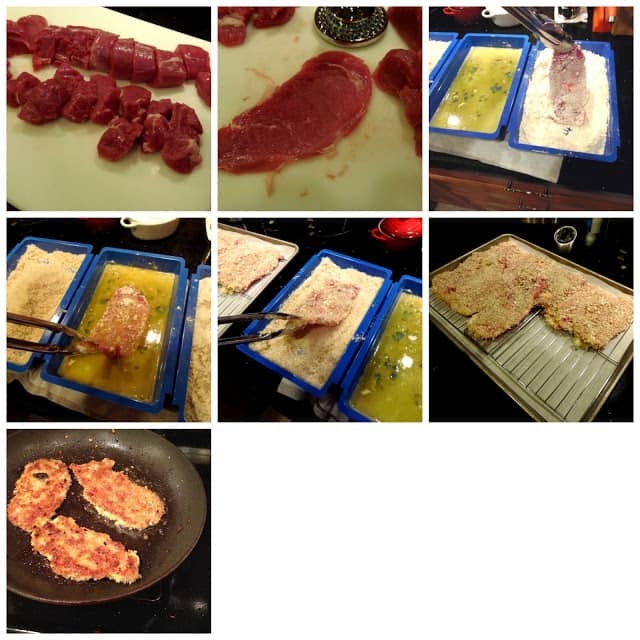 I came across your blog while viewing another and your recipe for Pork Schnitzel caught my eye. You have a great tutorial and I can wait to try it. Thank you for sharing with the Clever Chicks Blog Hop! I hope you’ll join us again next week! I plan on buying my pork for schnitzel this weekend…can't wait.